The Vikings travel to Indianapolis to open play during the 2009 preseason and play a Monday Night Football game at Houston on August 31. The Vikings will host Kansas City and Dallas to round out the preseason slate. 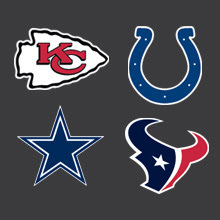 Specific dates for the Indianapolis, Kansas City and Dallas games are still to come. The Vikings open the 2009 preseason campaign at the perennial AFC power Colts and make their first appearance inside the new Lucas Oil Stadium. The Vikings will play Kansas City for the 15th time in preseason action, the 2nd-most games against any preseason opponent. The Vikings wrap up the preseason against Dallas, the team the Vikings played in the first-ever preseason game in franchise history on August 5, 1961 in Sioux Falls, SD. I am a new fan of the Vikings, recently moved into Chaska. Football is our passion. I would like to know what the progress is on the new Vikings stadium in Minneapolis area. Who can I talk to?